Parkinson's disease (PD) is characterized by rest tremor, rigidity, bradykinesia, and gait impairment, known as the “cardinal features” of the disease. Additional features can include freezing of gait, postural instability, speech difficulty, autonomic disturbances, sensory alterations, mood disorders, sleep dysfunction, cognitive impairment, and dementia. PD symptoms can be broadly classified as motor and nonmotor symptoms. Common motor symptoms include tremors, rigidity, bradykinesia, postural instability, walking or gait difficulties, and vocal symptoms. Both motor and nonmotor impairments affect the quality of life in individuals with PD. Freezing of gait (FOG) is perhaps the most severe motor symptom in PD and is manifestation of unintended halting of step-to-step production. People with PD may suffer from reduced mobility and resulting secondary issues. Participation in therapeutic exercise program may help ameliorate the undesired effects of decreased mobility as well as help augment optimal functional outcomes. The physical as well as cognitive benefits of aerobic exercise such as bicycling have been well documented in healthy population. Limited references to literature suggest preserved ability of bicycling, even in the face of freezing of mobility, namely gait. However, this role or ability of bicycling in PD has yet not been adequately represented in research. As suggested by Colquhoun et al., a scoping review or study is a “form of knowledge synthesis that addresses an exploratory research question aimed at mapping key concepts, types of evidence, and gaps in research related to a defined area or field by systematically searching, selecting, and synthesizing existing knowledge. The objective of this review was to assess and explore the relevance of the phenomenon of bicycling ability in PD through a brief review report of the last decade. The methodology followed was as per PRISMA guidelines, depicted in [Figure 1]. A PubMed search was initiated for the three keywords: Parkinson's disease, Bicycling, and Freezing of gait. The inclusion criteria were the presence of the three keywords in the title or abstract of the articles. The search filters applied acted as exclusion criteria. The search filters are described in [Table 1] and included article types, text availability, publication dates, species, and languages. [Table 2] shows the number of articles received for the combined as well as individual keywords. Although individual keyword search received much larger number of results, only 13 articles were available when the three keywords (Parkinson's disease, Bicycling, and Freezing of gait) were combined. Of the 13 articles presented by PubMed search, 3 were found not relevant to the three keywords searched and hence discarded. The remaining 10 articles were retained for further review. 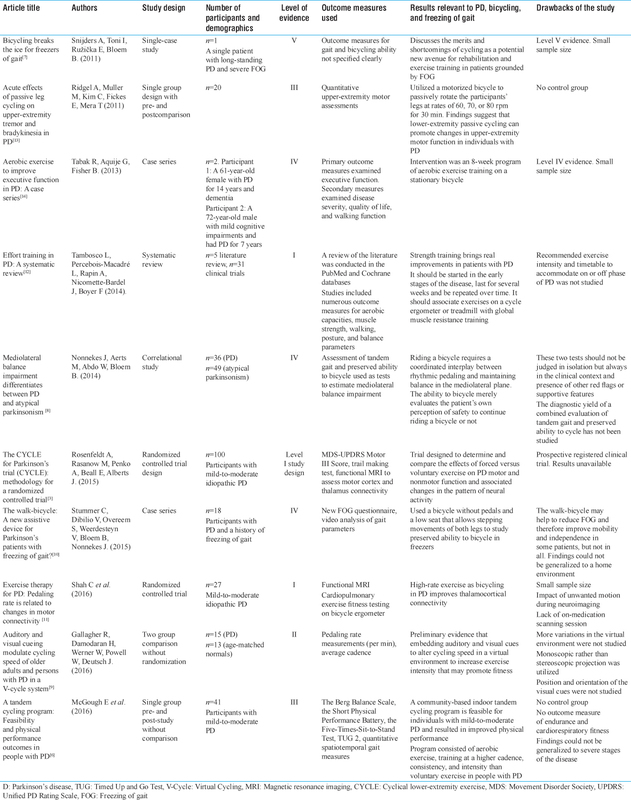 The 10 studies described in [Table 3] included case report, single group cohort, and comparative studies. These 10 studies published in indexed journals in PubMed over a period of 10 years from 2007 to 2016 were accessed and collected from their online database reviewed for their underlying neurophysiological mechanisms, their content, level of evidence, and study design. The studies included were found pertaining to the phenomenon of bicycling ability and its relation to the FOG episodes, in people with PD. The phenomenon of imagining cycling to reduce freezing episodes along with the preserved ability to cycle aiding in the diagnosis of typical and atypical parkinsonism was also explored. The information from these studies was synthesized, and different relevant themes that emerged from this information were noted. The themes arising from this review of the literature and relevant to the three keywords searched (i.e., Parkinson's disease, Bicycling, and Freezing of gait) are described below. Bicycling is a commonly performed aerobic exercise. Aerobic exercise is known to promote general cardiorespiratory fitness and muscle performance as well as neuroprotective effects on brain structure and function, impacting both motor and nonmotor functions in individuals with PD. Overall muscle strength is facilitated through exercises involving force generation at higher velocities and may have contributed to improved functional mobility outcomes. Patients with FOG have episodic problems with generating adequate steps. This phenomenon is both common and debilitating in patients with PD or atypical parkinsonism. As put forth by Snijders et al., the bicycle's rotating pedals may act as an external pacing cue, thus aiding in continued pedaling. It also described as to how the motor control mechanisms involved in gait, as compared with other activities that engage the legs, such as cycling, could be affected differentially in PD. This study attempts to provide an explanation about the preserved ability to bicycle in patients with PD, who may have difficulty walking because of FOG. In early disease stages, it can be difficult to differentiate clinically between PD and the various forms of atypical parkinsonism, such as multiple system atrophy or progressive supranuclear palsy. As put forth by Nonnekes, balance impairment in the mediolateral plane (i.e., sideways) is often seen in patients with a form of atypical parkinsonism but not in patients with PD. This was attributed to the distance between the feet during gait, which is typically normal (or even narrow) in PD, but widened in atypical parkinsonism. The ability to bicycle in PD patients also has a diagnostic value. Another study by McGough et al., a community-based indoor tandem cycling program, was designed with an aim to facilitate a higher cadence, consistency, and intensity of training. The above study described a high-cadence cycling protocol using mechanically augmented (or forced) exercise on a tandem bicycle. The protocol consisted of participants cycling three times/week for 10 weeks. Improved physical performance outcomes were demonstrated in mild-to-moderate cases participating in such a community-based indoor program. Virtual environments (VEs) are simulations of real-world environments that provide complex multisensory information to the user in a safe, engaging, and motivating context. This was attempted to explain by two studies, namely by Gallagher et al. and Stummer et al. An evidence-based cycling VE can modify pedaling rate in persons with PD and age-matched healthy adults. The study outlined persons with PD to direct attention to the visual cues in order to obtain an increase in cycling intensity. As a study result, embedding auditory and visual cues to alter cycling speed in a VE were found to be the method of increasing exercise intensity to promote fitness. Evaluation of the efficacy of VEs and serious games (using game theory and game mechanics) to address rehabilitation rather than recreation has been described by Stummer et al. They were documented to be successful in improving mobility and physical activity in healthy population and persons with PD. Forced exercise on a tandem bicycle has been described as a mode of aerobic exercise in which the rate of pedaling is facilitated at a higher cadence and consistency that would typically be performed voluntarily as put forth by McGough et al. The study concluded that forced exercise cycling results in global improvements in the cardinal symptoms of PD. As highlighted by Shah et al., forced-rate lower-extremity exercise has recently emerged as a potential safe and low-cost therapy for PD. They have attributed the efficacy as dependent on pedaling rate. They further described that such bicycling methods with rates above the participants' voluntary exercise rates are the most beneficial. Their results indicate that a plausible mechanism for the therapeutic efficacy of high-rate exercise in PD is that it improves thalamocortical connectivity. The themes surfacing through this brief review report do underline the relevance of the bicycling activity in people with PD. However, each study tries to explore different aspects of the bicycling activity in relevance to PD. The area of consensus among the reviewed studies is limited. Occupational therapy principles for the management of PD employ a wide range of interventions to address physical and psychosocial problems to enhance participation in everyday activities such as self-care, mobility, domestic and family roles, work, and leisure. The physical and mental health benefits of social interaction and physical activity are well established. The ability to bicycle in people with PD may provide novel avenues for the care and management of the condition. Further research is required to ascertain the exact role of bicycling ability in the care of people with PD. There is a definitive relevance of the phenomenon of bicycling in the assessment, differential diagnosis, treatment, and measuring outcome in both typical and atypical parkinsonism. The phenomenon of bicycling ability in PD has been inadequately studied and sparsely represented in the current research literature. The current level of evidence for this objective is low. There seems to be a promising potential for using bicycling as one of the primary tools for assessment and rehabilitation. This brief review report attempted to highlight the need for further research required for explaining the presence of kinesia paradoxa in people with PD. The mechanism that helps to retain the ability to maintain dynamic balance and reciprocal movements of lower limbs, while on a bicycle, warrants greater exploration, especially when similar abilities can be markedly affected in the same individuals, during walking. Further research is required to establish a consensus on the exact role of bicycling ability and identify novel avenues for its implementation in the care of people with PD. Olanow C, Schapira A. Parkinson's Disease and other Movement Disorders: Harrison's Principles of Internal Medicine. 18th ed. New York: McGraw Hill Medical; 2012;1: p. 3317-34. American Parkinson Disease Association. Symptoms of Parkinson's. New York: American Parkinson Disease Association; 2017. Available from: https://www.apdaparkinson.org/whatisparkinsons/symptoms/. [Last updated on 2017 Nov 01 and Last accessed on 2017 Dec 01]. Rosenfeldt AB, Rasanow M, Penko AL, Beall EB, Alberts JL. The cyclical lower extremity exercise for Parkinson's trial (CYCLE): Methodology for a randomized controlled trial. BMC Neurol 2015;15:63. Beck EN, Ehgoetz Martens KA, Almeida QJ. Freezing of gait in Parkinson's disease: An overload problem? PLoS One 2015;10:e0144986. McGough E, Robinson C, Nelson M, Houle R, Fraser G, Handley L, et al. A tandem cycling program: Feasibility and physical performance outcomes in people with Parkinson's disease. JNPT 2016;40: 223-9. Snijders AH, Toni I, Ružička E, Bloem BR. Bicycling breaks the ice for freezers of gait. Mov Disord 2011;26:367-371. Nonnekes J, Aerts MB, Abdo WF, Bloem BR. Medio-lateral balance impairment differentiates between Parkinson's disease and atypical Parkinsonism. J Parkinson's Dis 2014;4:567-569. Gallagher R, Damodaran H, Werner WG, Powell W, Deutsch JE. Auditory and visual cueing modulate cycling speed of older adults and persons with Parkinson's disease in a virtual cycling (V-cycle) system. J Neuroeng Rehabil 2016;13:77. Stummer C, Dibilio V, Overeem S, Weerdesteyn V, Bloem BR, Nonnekes J, et al. The walk-bicycle: A new assistive device for Parkinson's patients with freezing of gait? Parkinsonism Relat Disord 2015;21:755-757. Shah C, Beall EB, Frankemolle AM, Penko A, Phillips MD, Lowe MJ, et al. Exercise therapy for Parkinson's disease: Pedaling rate is related to changes in motor connectivity. Brain Connect 2016;6:25-36. Tambosco L, Percebois-Macadré L, Rapin A, Nicomette-Bardel J, Boyer FC. 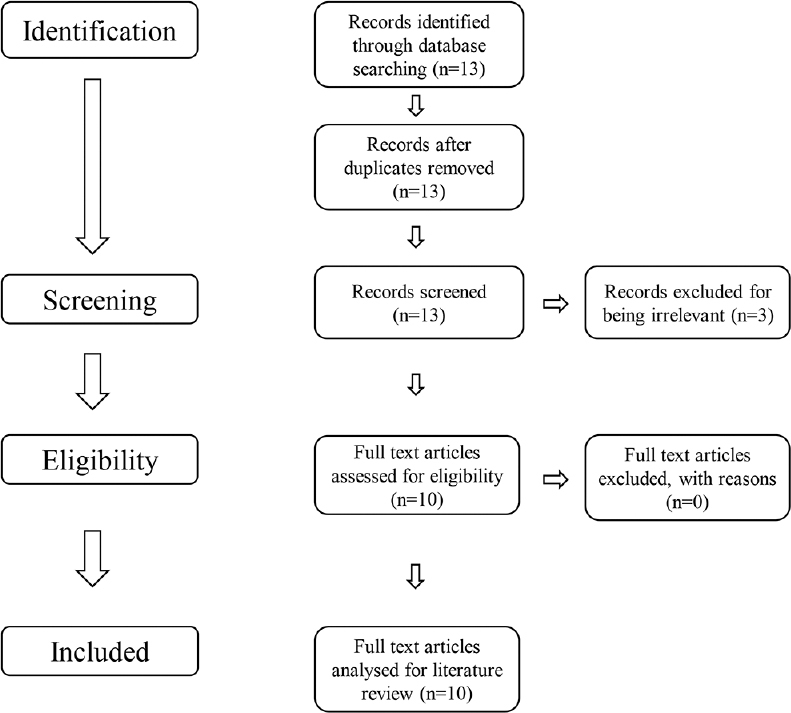 Effort training in Parkinson's disease: A systematic review. Ann Phys Rehabil Med 2014;57:79-104. Ridgel AL, Muller MD, Kim CH, Fickes EJ, Mera TO. Acute effects of passive leg cycling on upper extremity tremor and bradykinesia in Parkinson's disease. Phys Sportsmed 2011;39:83-93. Tabak R, Aquije G, Fisher BE. Aerobic exercise to improve executive function in Parkinson disease: A case series. J Neurol Phys Ther 2013;37:58-64. Aragon A, Kings J. Occupational therapy for people with Parkinson's. Best practice guidelines. 2015. Available from: https://www.parkinsons.org.uk/sites/default/files/201712/otparkinsons_bestpractiseguidelines.pdf. [Last accessed on 2018 Oct 10].